[Thursday, January 1, 2009] Governor Bill Richardson today announced that Virgin Galactic has signed a 20 year lease agreement with the State of New Mexico. [Friday, January 2, 2009] Falcon 9 is now fully integrated at the Cape! Today we mated the 5.2 m payload fairing to the Falcon 9 first stage. This was the final step in the integration process--one day ahead of schedule. [Monday, January 5, 2009] SPACEHAB reached an agreement in principal with RSC Energia, Russia's largest manufacturer of aerospace and space equipment, to provide facilities and support services for its Mini Research Module (MRM1). [Monday, January 5, 2009] On Monday, Jan. 5, NASA issued a request for proposal for the Ares V rocket that will perform heavy lift and cargo functions as part of the next generation of spacecraft that will return humans to the moon. [Thursday, January 8, 2009] Last year, I addressed the considerations governing the design of NASA's Constellation architecture. However, judging by the many questions I receive on the topic, I didn't do a very good job, so I will try again today. [Saturday, January 10, 2009] As we all know another administration change is coming and with change as the operative theme of this administration, we can surely expect that this will come to NASA's direction. [Monday, January 12, 2009] Taking the newly discovered Aerogel insulation technology developed by NASA, which is the highest insulating material in existence, Thermablok(TM) developed an amazing product that may soon become a requirement in the building industry. [Monday, January 12, 2009] Space Exploration Technologies Corp (SpaceX) announced its Falcon 9 launch vehicle was successfully raised to vertical on Saturday, January 10, 2009, at Space Launch Complex 40 (SLC-40) in Cape Canaveral, Florida -- two days ahead of schedule. [Monday, January 12, 2009] We believe that the lack of OIG recommendations regarding the economy and efficiency of NASA's programs and activities has resulted in the relatively low amount of reported monetary accomplishments when compared to other OIGs during fiscal year 2007. [Monday, January 12, 2009] A new report from the Aerospace Industries Association concludes that the nation can no longer afford to treat its national security, civil and commercial space capabilities separately. [Tuesday, January 13, 2009] Sources report that The Obama Transition Team has circulated a name for vetting for the job of NASA Administrator: Major General Jonathan Scott Gration. [Thursday, January 15, 2009] After a careful review of all the facts and in consideration of all of the source selection documentation provided to date, PlanetSpace has filed a protest to NASA's award of the ISS Commercial Resupply Services Contract. [Friday, January 16, 2009] NASA has exercised an $86 million, one-year contract option with Hamilton Sundstrand Space Systems International of Windsor Locks, Conn., for work on spacesuits used on the space shuttles and the International Space Station. [Friday, January 16, 2009] NASA and the Northrop Grumman Corp. have unveiled the first Global Hawk aircraft system to be used for environmental science research, heralding a new application for the world's first fully autonomous high-altitude, long-endurance aircraft. 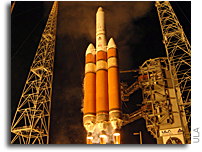 [Sunday, January 18, 2009] United Launch Alliance's Delta IV Heavy rocket carrying a payload for the National Reconnaissance Office successfully lifted off from Space Launch Complex 37 at CCAFS at 9:47 p.m. EST today. [Tuesday, January 20, 2009] Michelin North America will once again team with NASA to showcase the latest technology for the next generation of moon rover vehicles. [Tuesday, January 20, 2009] The Heinlein Prize Trust announces the Microgravity Research Competition to reward innovation in the use of microgravity to advance biotech, nanotech, combustion, metallurgy, and other fields. [Saturday, January 24, 2009] The FAST program will facilitate technology maturation by providing access to space-environment testing, which is a key step in moving technologies from a lower to higher level of readiness. [Monday, January 26, 2009] Reporters are invited to view new hardware that will be used in the launch of the Ares I-X rocket, which will be the first flight test to develop the Ares I rocket. Ares I is part of NASA's next generation spacecraft and launch vehicle system. [Monday, January 26, 2009] These tests were in preparation for Pad Abort-1 and Ares I-X flight tests, as well as the ground test of the first five-segment motor for Ares I -- all scheduled to be performed this year. [Monday, January 26, 2009] Pratt & Whitney Rocketdyne's Common Extensible Cryogenic Engine (CECE) has successfully demonstrated critical capabilities required for NASA's Altair lunar lander. [Tuesday, January 27, 2009] After a two-year, top to bottom renovation, the High Bay Facility of the O&C Building at NASA'S Kennedy Space Center is now ready to begin preparations to build the new Orion crew exploration vehicle -- the flagship of NASA's Constellation Program. [Wednesday, January 28, 2009] Eutelsat has announced that the performance of the W2M satellite does not comply with the requirements set with the spacecraft's manufacturer following a major anomaly affecting the satellite's power subsystem.